The lecture I presented at the Skalny Center last fall focused on the emergence of modern jazz in Poland of the 1960s, a development that offers a fascinating glimpse into the reception and transformation of American jazz on the other side of the Iron Curtain. This process began with an extensive imitation of American models, which in this part of Europe was hampered by censorship and other restraints imposed by socialist regimes. In Poland, in 1949 socialist realism, or socrealizm in Polish jargon, was declared the official, one and only artistic ideology at a series of national conventions and meetings of ideologues and artists, who were put up to represent the visual arts, theater, film, architecture, and music. This doctrine, which demanded that all art be “socialist in content, and national in form,” did not last for very long, as immediately following Stalin’s death in 1953 the restrictions imposed on art began to loosen. Artists’ groups began demanding greater freedoms, and Communist officials realized that they had to make some concessions in order to stay in power. The arts, including art music and jazz, greatly benefited from the political “thaw” of the early 1950s. Polish jazz in its modern sense did not exist before 1955. Stylistically, the music played in Poland at the time was heavily influenced by Dixieland and swing, with only occasional touches of bebop and cool. Still, the search for the discovery of progressive ways of playing was already on. A strong impulse came from an unlikely source: the Voice of America’s new music program called Music USA, hosted by broadcaster Willis Conover. A year earlier the VOA hired Conover in the wake of increased efforts by the U.S. State Department and USIA to include jazz in their cultural outreach programs, designed as anti-Soviet propaganda. Conover, it was hoped, would accomplish a specific task: to turn the music he loved into a “secret sonic weapon.” Beginning on January 6, 1955, a segment of his daily broadcast called Jazz Hour became the main intercontinental tunnel through which “the music of freedom” unabashedly traveled across the borders to all corners of the Eastern Bloc. This provided a window to the best in American jazz, and at the same time became the main form of jazz education, and this ultimately proved instrumental in the development of many diverse styles of European jazz. Although it became a cliché to hear that someone had learned how to play jazz from Willis Conover, there are indeed thousands of testimonies to the inspiration this program was for the Soviet Bloc and the world. As a man whose broadcasts made him the best-known American abroad, Conover may have been, as Gene Lees noted, one of the “unsung heroes” who did the most to bring down the Soviet Union. It is not the case, however, that when Conover launched his jazz program, the music was still blacklisted in Poland, as was still the case in the rest of the Soviet Bloc. In fact, by the mid-1950s Poland functioned as a meeting place of two politically opposed currents: the American propaganda that used jazz to promote the superiority of the West; and the socialist propaganda, which gradually embraced jazz in an effort to project a progressive image to the outside world. This embrace of a Western product by a communist regime was nothing new. According to Włodzimierz Sokorski, the most ardent ideologue of socialist realism, even the grand architectural edifices, erected by Stalin as testimonies to the greatness of socialism, had been conceived in the spirit of American architecture. 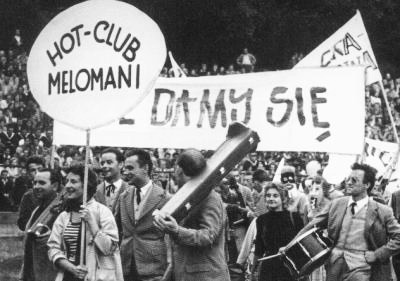 The appropriation and utilization of jazz as a tool of Communist propaganda in the late ‘50s and ‘60s was very similar, and it is well documented in numerous episodes of the national newsreel Polska Kronika Filmowa (Polish Film Chronicle), in which the presentation of positive aspects of life in the Polish People’s Republic – popularized in select news stories, current affairs, and cultural events – was luxuriantly accompanied by the uplifting sounds of jazz. Thus, in a rather remarkable twist of events these two political currents surrounding jazz seemed to merge. The “sonic weapon” did its work, luring the youth with its magical spell of coolness, while the establishment decided to go modern and capitalize on the nation’s fascination with these “exotic” sounds. However unusual this configuration may have appeared, it was no doubt extremely advantageous for jazz. The year 1956 represents a turning point in the post-war history of Polish jazz, as in Polish history generally. In August the first official jazz festival was held at the seaside resort of Sopot, just a month before the first “Warsaw Autumn” Festival opened in the Polish capitol, and only two years after Newport, Rhode Island, hosted its first jazz festival ever. From the political point of view, the Sopot event came two months after the workers’ demonstrations in the Polish city of Poznań and two months before the beginning of the Hungarian revolt against the Stalinist government. Described by the press as “the Sopot earthquake,” the festival stirred the emotions of the youth and elicited fears of rebellion among the guardians of the socialist order. Musically, the festival illustrated a passionate fascination among Polish musicians for a variety of jazz styles, ranging from Dixieland to cool and hard bop. The most modern group at the festival was the Komeda Sextet, led by Krzysztof “Komeda” Trzciński (1931-1969), a young doctor who had abandoned his medical career in order to pursue his love for jazz. He was soon to become an iconic figure in Polish jazz and an internationally known composer of music for over 40 films. In 1965 Krzysztof Komeda recorded Astigmatic, the first significant free jazz album in Poland and one of the landmark recordings in the history of European jazz. 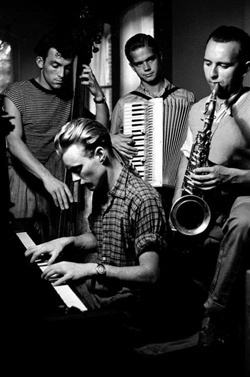 A collaborative effort of Komeda, Stańko, and Zbigniew Namysłowski from Poland, bassist Günter Lenz from West Germany, and drummer Rune Carlson from Sweden, the album featured extended free compositions by Komeda – “Astigmatic,” “Kattorna,” and “Svantetic” – which originated a completely new direction for jazz, one that was deeply rooted in a specific “Slavic feeling.” This album thus marked a high point in the long development from “jazz in Poland” to “Polish jazz,” a journey that seems to have traveled at the speed of light. The term “Polish jazz” should not be taken to imply the existence of a national jazz school, especially one grounded in Polish folk traditions, although numerous efforts to adapt various folk materials to jazz were made during this period. These included Jan Wróblewski’s “Bandoska in Blue,” the first response to Willis Conover’s call for folk-influenced jazz, Variations on the “Chmiel” Theme and Variations on “Near the forest” by Andrzej Trzaskowski, as well as a number of later pieces by Zbigniew Namysłowski. Considering the bastardization of the folk idiom in mass songs and similar musical inventions of socialist realizm, this renewed interest in folk music among the new generation of Polish jazz musicians may seem somewhat unexpected. And yet, it is compelling to view this phenomenon as an attempt to reclaim the folk traditions and recast them in a new, modernist spirit. However, most Polish musicians from that period would have objected to any nationalistic claims. In a 1966 interview, pianist Andrzej Trzaskowski claimed that the mainstream of contemporary music, including world jazz, was international in scope rather than national, and so the creation of a “Polish school” was unlikely. Nevertheless, Trzaskowski did admit the possibility of a common pool of stylistic features, perceivable more in terms of mood rather than technique, which might unite the work of Polish jazz musicians. Without a doubt, all significant names in Polish jazz at that time (Krzysztof Komeda, Tomasz Stańko, Andrzej Kurylewicz, Włodzimierz Nahorny, Zbigniew Namysłowski and Trzaskowski himself) developed their own individual styles, but they also jointly contributed to the transformation of the received models of American jazz into an experimental art music that had an unmistakable Polish flavor. This musical idiom represents one of the most original developments in the European East. In Poland of the 1960s, with its strong nationalistic consciousness and aspirations for liberty, the unique style of Polish free jazz spoke to the listener with a particular force. Together with the highly unconventional, noise-based style of sonorism in art music, the intellectually challenging works of the so-called Polish Poster School and the self-reflective and “cool” productions of the Polish Film School, jazz greatly influenced the explosive cultural revival of the 1960s. Its presence was felt everywhere, as the music was not only played and recorded but it also interacted with the other arts: ballet, theater, cinema, poetry, and the visual arts. As a symbol of modernity, it played a crucial role in the shaping of Poland’s modern cultural identity, defined by the country’s unique position between East and West.